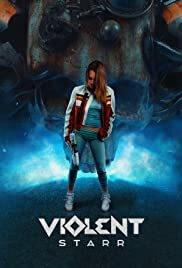 Violent Starr is a female space pirate, that ascends to be a hero through an artifact of a legendary warrior. She fights against the Godmichael and his evil minions swarming out to eliminate creatures and races that they deem "unworthy". "Violent Starr", sci-fi adventure starring Michael Berryman! Trailer out now! Comments: Still some work to do. It's gonna be all good.